Slaughtneil retained the Ulster Club Hurling title as they pulled away in the second half to earn a dominant 2-21 to 1-12 win over Ballygalget at Armagh. Ballygalget led 0-3 to 0-2 but Sean Cassidy's goal gave the holders a lead which they never relinquished. Trailing 1-7 to 0-6 at half-time, Ballygalget stayed in touch before Cormac O'Doherty's 54th-minute penalty ended the game as a contest. Caolan Bailie's late goal was scant consolation for the Down champions. The only downside from the game for Slaughtneil was a heavy knock to the chest suffered by goalscorer Cassidy in the second half which led to him being stretchered off. Cassidy required oxygen after the incident and was taken to Craigavon Area Hospital as a precaution - he was later given the all-clear and realeased. Ballygalget's Mark Fisher was sent off late on following a second yellow card after conceding the penalty while Slaughtneil's Chrissy McKaigue looked fortunate to only be handed a caution after an off-the-ball incident which left Jordan Doran on the turf. 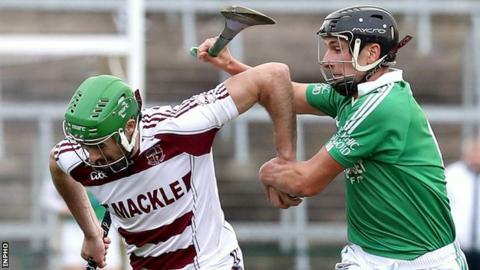 McKaigue is among 14 members of the Slaughtneil hurling squad who will be involved in the Ulster Club Football quarter-final against Omagh St Enda's next weekend. After their impressive 1-18 to 2-8 semi-final victory over Dunloy, Slaughtneil went in as strong favourites and while they were as sharp as two weeks ago, the holders always looked in control. With Fisher and John McManus impressive early on, the Down champions made a promising start as an outstanding save from keeper Jamie Crowe to deny Se McGuigan helped them take a 0-3 to 0-2 lead. However, Cassidy's 12th-minute goal nudged Slaughtneil ahead as Ballygalget began to have to rely on Gareth Johnston's frees for scores. Man mountain Johnston was struggling to make an impact in open play despite his five first-half points. Ballygalget outscored Slaughtneil 0-4 to 0-3 in the nine minutes after half-time to leave only a puck of the ball between the sides but the champions responded with three unanswered scores helped by full-forward Brendan Rogers' move to centre half-forward. Cassidy's injury led to a delay of several minutes and he was attended to by paramedics. However, Slaughtneil regrouped to put the game to bed as the superb Gerard Bradley pointed and then won a penalty which was netted by O'Doherty despite Crowe getting a stick to the fierce shot. Fisher received his second yellow card for the foul on Doherty which led to the penalty. After John McManus missed a glorious chance to pull a goal back for Ballygalget, McKaigue had his lucky escape after raising his hands at Doran. As large sections of the 3,500 crowd headed for the exits during the nine minutes of injury-time, Bailie did net for Ballygalget after a Johnston's 20-metre free had been blocked. Slaughtneil's victory completed an Ulster double for the Robert Emmets club after their camogs retained their Ulster title with an exciting 2-11 to 3-5 win over Loughgiel in the curtain-raiser at the Athletic Grounds. Two Racquel Murphy goals helped Loughgiel lead 2-3 to 0-7 at half-time with defending All-Ireland champions Slaughtneil having to rely heavily on Offaly woman Tina Hannon for their scores. A Roisin McConville goal left Loughgiel leading 3-5 to 0-11 but Louise Dougan's penalty brought the sides level before Therese Mellon's goal put Slaughtneil into the lead. Loughgiel attempted frantically to get on terms in the closing moments with Murphy seeing a 20-metre free blocked on the line by Dougan. Hannon finished with 0-10 for the winners.